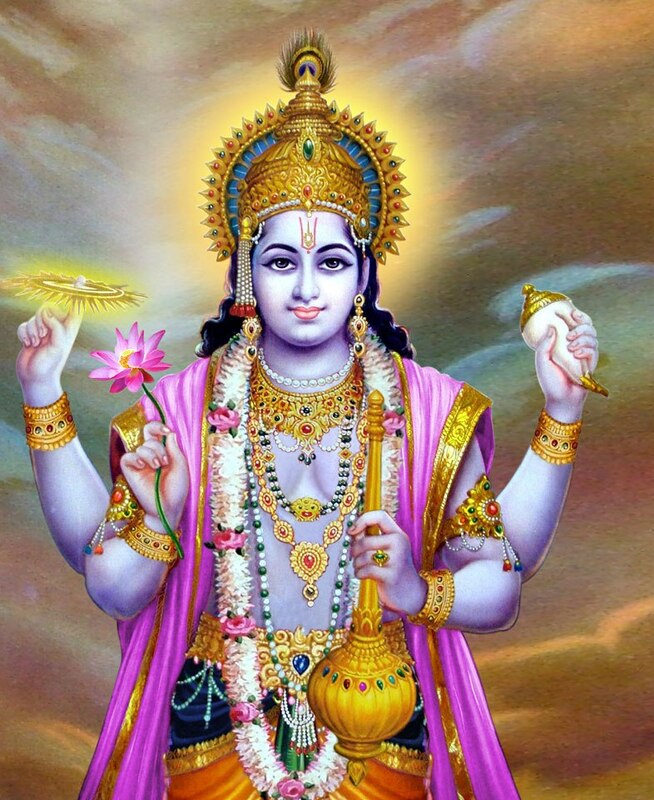 In this Part, we will explore the meaning of the Fifteenth Shloka of Sri Vishnu Sahasranamam. 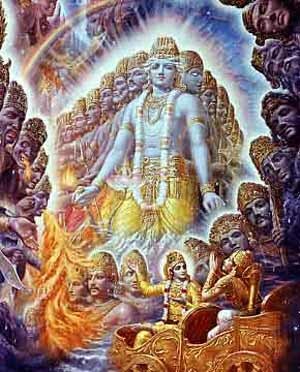 Bhagavan is the Lord of the Worlds, the Devas and Dharma and without his will not even an atom can move. He is transient as well as eternal and gives the fruits of action to the deserving and ensures that those who are not acting in accordance with Dharma are punished. He is both the Cause and the action that is present in all states. He has four emanations or forms of which three, namely – Pradyumna, Aniruddha and Samkarshana, are for his functions of Creation, Protection and Dissolution respectively. His Para form of Vasudeva is the Parabrahmam. HE has four canine teeth exemplified in his Narasimha Avatar and HE has four arms each holding Conch, Discus, Mace and Lotus respectively with each signifying the four purushartas of Dharma, Artha, Kama and Moksha. ‘Lokaan Adhyakshayati iti Lokaadhyakshah – He supervises, controls and presides over all the worlds.’ The implication is that He is the Supreme master of all the worlds. As Adi Sankara explains ‘Sarveshaam lokaanaam Praadhaanyena Upadrashtaa – He oversees all worlds as the number one in charge’. Loka means people and Adhyaksha means Master or Superintendent. Hence, an alternate interpretation is HE is the Master of the people. ‘Lokapaalaadi Suraanaam Adhyakshah Suraadhyakshah – He is the controller of the Devas who protect the worlds’. There are many gods who represent various natural elements for the functioning of the worlds. For example Varuna Deva gives water, Agni Deva gives fire, Vayu Deva gives air etc. Bhagavan is the presiding power over all these Suraas or Devaas. When the Devas swerve from their path, BhagavAn takes over and ensures that their violations are set right. For instance, when Indra got angry with the Gokula-vasees and tried to destroy Gokulam with torrential rain, Lord KrishNa bore the Govardhana mountain as an umbrella on his little finger. He protected the people from Indra’s fury and brought Indra under HIS control. The implication is that Bhagavan is the presiding deity over all our actions and grants the fruits of the Dharmic acts. He ensures that actions, which are against Dharma, are punished. HE ensures that those who act in accordance with Dharma do not go unrewarded and makes sure that benefits are not obtained by those who do not observe Dharma. Taking the above three names together the full meaning of the Tamil saying ‘Avananri Oranuvum Asaiyaadu’ – meaning ‘Without Him not even an atom can move!’ becomes clear. 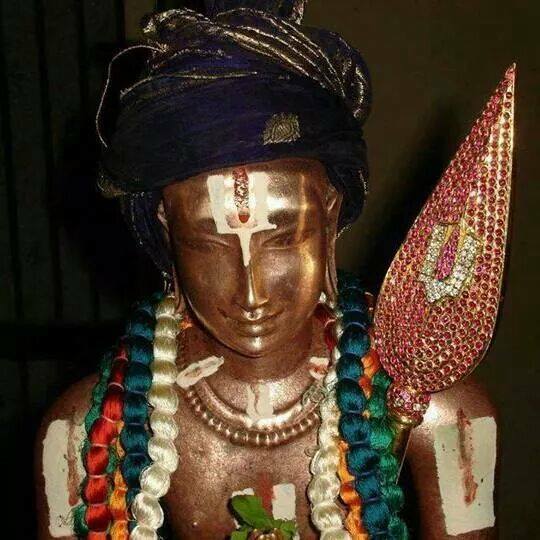 Sri Thirumangai Azhwar was the youngest and the last of the Azhwars. He was born on in Thirukkurayalur in Thiruvalinadu. 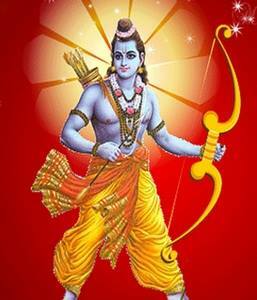 He was considered as the incarnation of the divine bow ‘Sarngam’ of the Lord. He became a chieftain of the Chola king while he was young. He was known by a variety of names including Parakaalan, Kaliyan, Mangaiyarkone. His call to spiritual journey and unwavering Bhakti came when he married the beautiful Kumudavalli Naachiyaar. She set two conditions before she would marry him. One was for him to embrace Sri Vaishnavism by taking proper instruction from an Acharya and the second was to serve 1008 devotees with a grand meal every day for one year. His ardent desire was to keep his promise he made to his wife resulted in him spending beyond his means. When he had difficulties meeting the expenses, he dipped into the tax amount that was collected for the Chola King. Enraged by the misuse of funds, the King sent his troops who were rebuffed. After that the King attacked and made him a captive in the temple. He was vexed and upset with the Lord for not showing him the way. 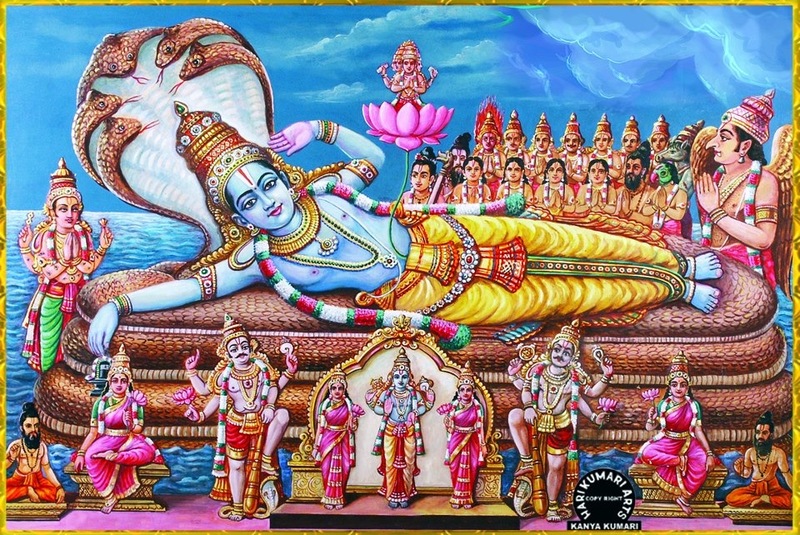 Due to his devotion and the Lord’s love for Thirumangai Azhwar, the Kanchi Varadaraja Perumal appeared in his dream and revealed the location of a hidden treasure in Kanchipuram. He persuaded the King to allow him to find the treasure and after he found the same, he compensated the King and continued feeding the devotees. Eventually even these funds ran out and he decided to rob the rich, helped by a 3 other friends, to keep up the feeding of the devotees. The Lord’s grace came to Thirumangai Azhwar during one of those occasions when he waited to waylay a rich couple travelling through the woods in the night. 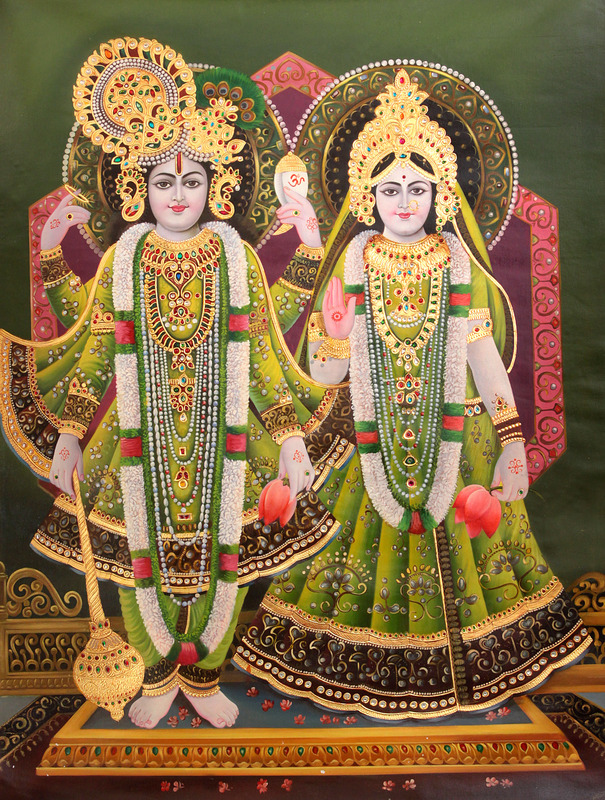 The Lord Himself along with his consort Sri Maha Lakshmi came in the form of a newly wed well decked couple. The Azhwar got the bridegroom to bundle up all the jewels and part with them by mere show of his sword. He tried to remove the jewels from the Lord’s feet too. But the jewellery bundle was too heavy for the Thirumangai Azhwar to carry. He felt that the bridegroom had put some kind of a “magic” spell on him. He forced Him to reveal the “mantra”. Following this, the Lord imparted the ‘Ashtaakshara’ mantra to Thirumangai Azhwar. The Azhwar was immediately transformed. He refers to this in the 5th verse of the first decade in Periya Thirumozhi and mentions how effortlessly he obtained the grace of the Lord by saying ‘Kalvanen aanen….chikkena thiruvarul petren’ meaning ‘I became a robber and quickly obtained the Lord’s grace’. The Lord revealed Himself to the Azhwar and commanded him to visit all His Divya Desams or holy shrines. Sri Thirumangai Azhwar visited many Divya Desams; some, difficult to reach, such as Naimisharanyam, Badrinath and Ahobilam. Thus Thirumangai Azhwar sang his mangalasaasanam or benediction on these shrines. Thus all the Divya Desams sung by the various Azhwars, have a special significance for the ardent devotees. Sri Thirumangai Azhwar was a very talented poet and he had a large share of verses in the Naalaayira Divya Prabhandam, with a variety of intricate poetry. One such work is Thiruvezhuk Kootrirukkai. The other five works are Periya Thirumozhi with 1084 verses, Thirukkurun Thandakam, Thiru Nedun Thandakam, Siriya Thirumadal and Periya Thirumadal. Thirujnana Sambandhar, one of the 63 Naayanaar saints was a contemporary of the Sri Thirumangai Azhwar. The Azhwar’s poetic skills were challenged by him when he visited Sirghazhi. The Azhwar sang ten verses on Sirghazhi Sri Ramar (Periya Thirumozhi III-4) and won the admiration of Thirugnana Sambandhar who presented him with his trident acknowledging the Azhwar to be a Nalu-kavi perumal. Hence, Sri Thirumangai Azhwar is seen in the temples holding a trident in his hands. 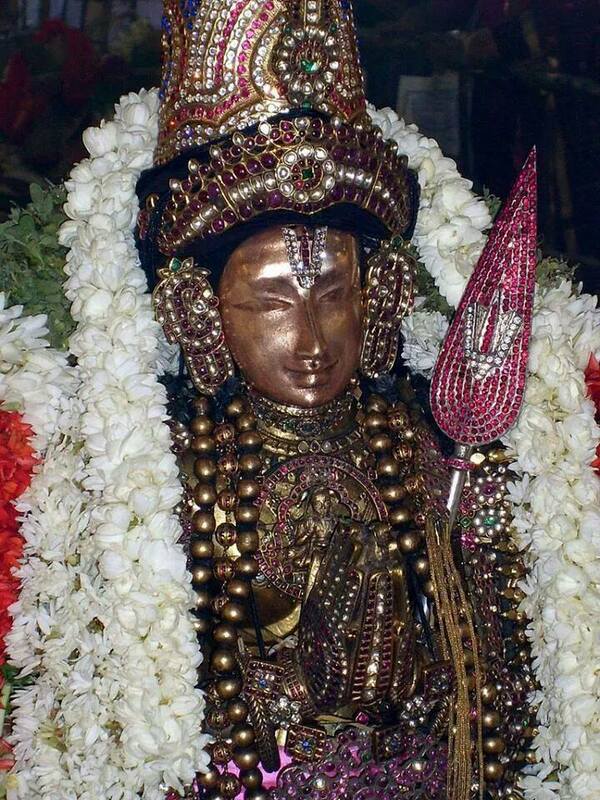 The first ten paasurams of Periya Thirumozhi beginning with “Vadinen Vaadi Varundhinen Manathal” are very beautiful. In these verses, the Azhwar feels elated about receiving the blessing of Sriman Narayana mantra from the Lord HIMSELF. He points out all its benefits and explains how it will remove all our woes and bring us “divine bliss” even in this world. He entreats all to chant the Narayana Namam. Meaning: Chant Narayana’s name when life begins to fade. Think of Narayana’s name when in distress, it is good to say even when there is none. It is the medicine for all our ills”. One who is both the cause and effect of all things. One who has a form which is nitya or permanent, as well as transient forms. The grantor of fruits that are this-worldly as well as those that are eternal. This is a combination of two words i.e. Krita and Akrita. Krita refers to the action that is completed namely the effect. Akrita refers to an incomplete action namely a cause not yet given effect to. This can also mean that Bhagavan appears with a form of Akritam or everlasting in nature, and also with forms, which are Kritam or remain only for a limited time. 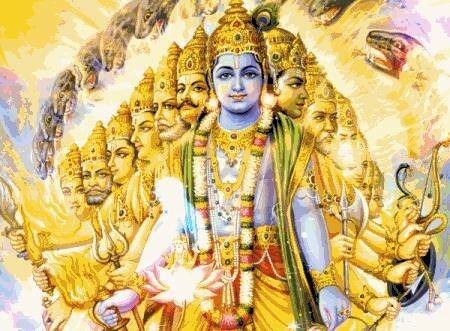 Kritam is manifested or vyaktam while akritam is unmanifested or avyaktam. 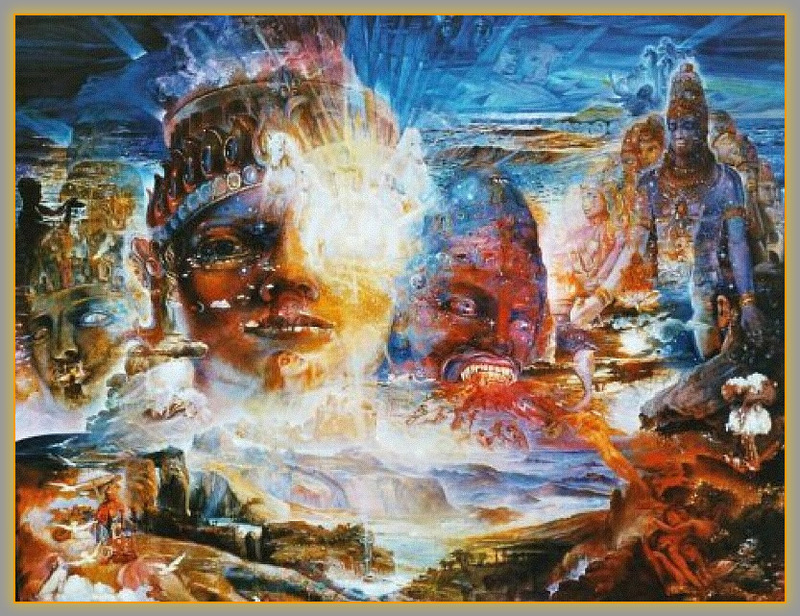 According to Vishnu Purana, the four energies of Bhagavan for creation are – Brahma, Prajaapati (like Daksha), time, and all existing creatures. The four engines of Bhagavan for protection are – the omnipresent Vishnu, the law makers (like Manu), time, and all existing creatures. The four energies of Bhagavan for dissolution are – Rudra, time, the god of death, and all existing creatures. Thus He is appropriately named Caturatma or the four-aspected-one. In Adi Sankara’s words ‘Sargaadishu Prithak Vibhootayah chatasrah aatmaanah moortayah yasya sah – In each of his functions of Creation, Protection and Dissolution He has got four distinct energies and hence he is called Caturatma’. This Nama is interpreted to be signifying the four Vyuhas or emanations of the Lord, viz. Vasudeva, Samkarshana, Pradyumana, and Aniruddha, hence Bhagavan is called CaturVyuhah. Vyuha refers to a form that has a purpose associated with it. Pradyumna is for Creation; Sankarshana is for Destruction; Aniruddha is for Protection; Vasudeva is the overall leader of these three forms. Pradyumna, the one in charge of Creation, is endowed with the leadership of Aisvarya and Veerya. 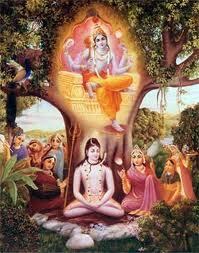 Pradyumna means One who has enormous Veerya in His responsibility of creation. Aniruddha, in charge of protection, is endowed with immeasurable Sakti and Tejas. Aniruddha means One who cannot be obstructed in His function of protection. Samkarshana is endowed with enormous Jnanam and Balam. Sankarshana means One who attracts or draws everything towards Him and makes them draw into Him during the pralaya or great destruction. 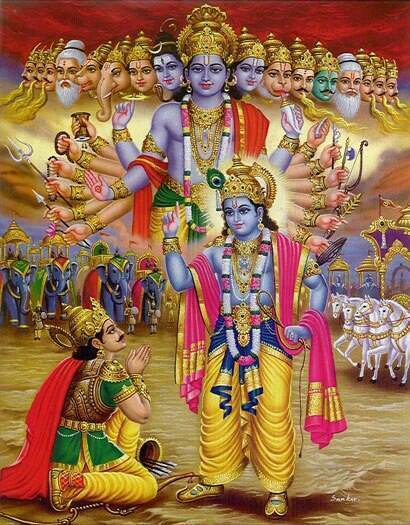 Vasudeva is the form endowed with all the six qualities and is the Supreme Parabrahman. Damshtra refers to the incisor teeth on either side of the mouth. 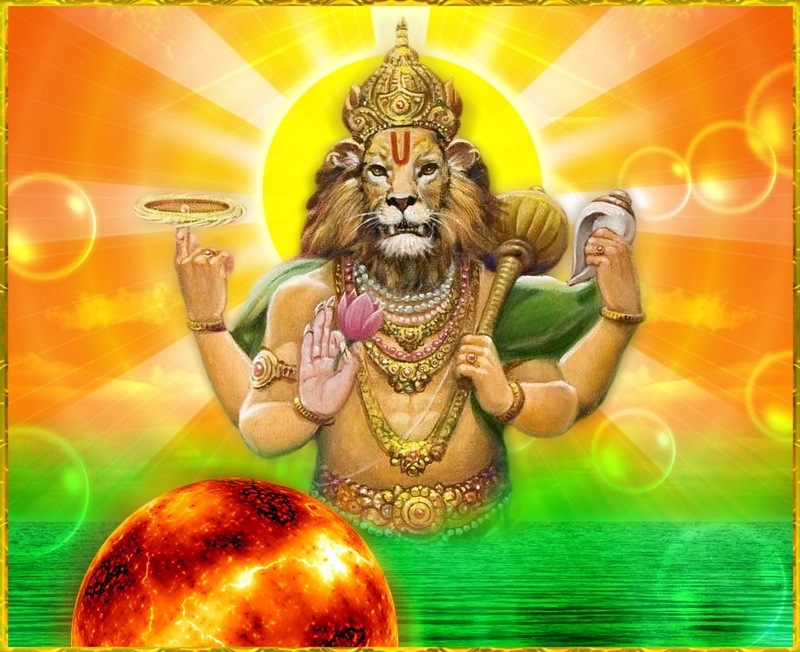 Sri Adi Sankara says ‘Chaturdamshtrah Narasimha Vigrahah’ meaning that the Nama reflects Lord Narasimha’s image’. SrI Parasara Bhattar points out that Catur-damshtratvam is a MahApurusha LakshNam. He gives reference to the description of Sri Rama by Hanuman to Sita Devi – catur-daSa sam-dvandvah catur-damshtrah catur-gatih – One who has the fourteen parts of the body fully symmetric with no blemishes, One who has four beautiful canine teeth, and One who has the beauty of the walks of elephant, tiger, lion, and bull. (Valmiki Ramayanam Sundara kandam – 35.19). Another meaning for Damshtra is a hill-top or a horn. Rigveda says ‘Chatvaari shringaah – He has four horns. It can also refer to the tusk like projection of the Adi Varaha with which HE lifted the earth from the ocean and saved it from the demon Hiranyaaksha. ‘Chatvaarah Bhujaah asya asti iti Caturbhujah – He is called Caturbhujah because He has four arms’. Interestingly the name ‘Caturbhujah’ appears both in the first and last Dhyana Shlokas of Vishnu Sahasranamam, namely ‘Shuklambaradharam Vishnum Shashivarnam Caturbhujam’ and ‘Chandrananam Caturbahum Shreevatsankitavakshasam’. The four hands carry the Conch, the Mace, the Discus, and the Lotus respectively. Swami Chinmayananda gives a very interesting explanation of how the four arms are used by the Lord in maintaining Dharma. The Conch calls a man to the righteous path that directly leads to peace and perfection. Not many of us listen to this inner voice of conscience, the sound of the Conch, and hence HE gently wields the ‘Mace‘ which brings a bit of suffering from small calamities and tragic jerks in our existence. If the individual still does not listen to the call of the ‘Conch’ and the tap of the ‘Mace’, the ‘Chakra‘ – the wheel of time, annihilates the entire being. 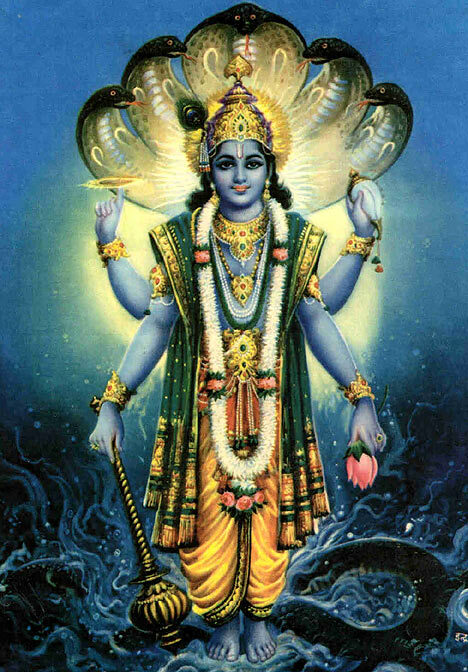 This call and punishment are solely meant to take man to the Ultimate Goal, symbolised by the ‘Lotus‘ in His hand, i.e. Salvation or Moksha. Sri Radhakrishna Shastri gives the explanation that with the four hands; He gives the four purushartas (Dharma, Artha, Kama, and Moksha) to people. Or the four arms represent the four tatvas – Satva, Rajas, Tamas, and Ahamkara. Satvam Rajas Tama iti ahankAraScaturbhujah (gopAlottaratAmini 55). Yet another explanation is that the Self functions in a four-fold pattern involving Mind, Intellect, Chit, and Ego. These are represented by the four arms containing the Conch, the Mace, the Chakra, and the Padma. The Chit is represented by the Lotus or Padma, the intellect is the ‘Conch’, Ego is the ‘Mace’, and the Mind is the ‘Discus’. Hence the Lord is Caturbhujah. 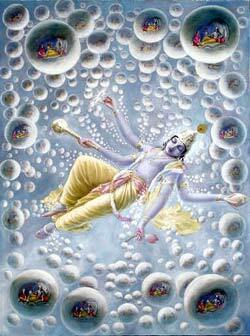 Bhagavan is the Lord of worlds, hence He is called Lokaadhyakshah. He is Suraadhyakshah as Lord of the Devas. He is Dharmadhyakshah as He gave the Vedas which are basis for Dharma. He is both the Cause and the Effect. Without his will not even an atom can move, hence He is Kritaakritah. He has four-fold manifestation and hence He is CaturAtma. He has four emanations or forms of which three, namely – Pradyumna, Aniruddha and Samkarshana, are for his functions of Creation, Protection and Dissolution respectively, His Para form of Vasudeva is the Parabrahman, hence He is CaturVyuhah. HE has four canine teeth exemplified in his Narasimha Avatar. so He is called CaturDamshtrah. He has four arms each holding Conch, Discus, Mace and Lotus respectively with each signifiying the four purushartas of Dharma, Artha, Kama and Moksha, hence He is called CaturBhujah. Thank you very much for this wonderful post Mr.Sridhar & Mr. Shri Balaji. Your selfless efforts is very much appreciated by one & all. Hari Om! You are welcome Nirmala 🙂 Thank your for your kind words of appreciation. Hari Om. superb post. the story on thirumangai azhwar was enlightening. good tamil usage..learnt a lot of new words.. avan inri oru higgs bosonum asaiyathu.. Thank you for such a blissful post & a special thank you for the reference story. Very interesting. God bless you my Son! Amen! Hari Om!